Sorry, didn’t see your message! … Yes, everything is new since I am just beginning. Thanks for your help! Would you mind looking over my tribute page? It’s mostly good I think excepct for the caption on the picture, and my bullet points that are on the left with the text in the middle. If you can help, thank you! Um, first off, I don’t think “He’s one fry short of a Happy Meal” is a quote that goes along with your tribute. If you are trying to make a tribute to Obama as the first president of color, you may want to find a better quote. If you are trying to be sarcastic, well then I don’t know why you compliment him as the first president of color. 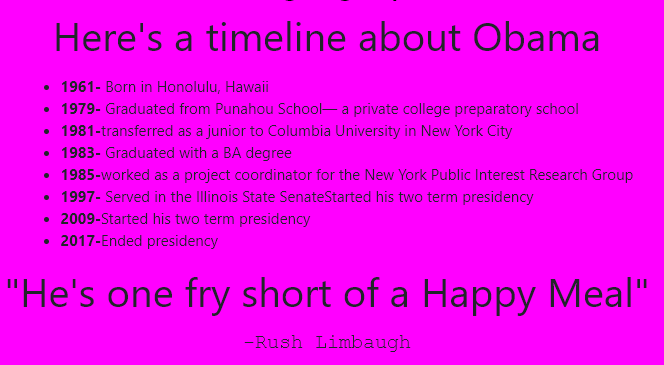 In that quote Limbaugh is basically stating the Obama is “Nutty, Crazy, Simple, Retarded”. So, you might want to rethink your quote if you disagree. I have moved your post to a new topic, as it really doesn’t relate to “adding bootstrap to codepen”. Okay- as for the quote, I really dont care, just trying to do the coding thing. Don’t really care about content to be honest. I appreciate the comment though:D I just want to finish this project. As for the alignment, I will give it a try!